Efficiency at its finest! The Deckside Suite is the perfect vacation rental in Key West for those who are trying to get the most bang for their buck. You have everything you need in this cozy, studio-style unit, including a kitchenette, cable TV, free Wi-Fi, and a shared back porch, hot tub, and BBQ grill. This property is a short distance to all the fun nightlife on Duval Street, but is still very private. Walk to one of two shared pools merely two blocks away! 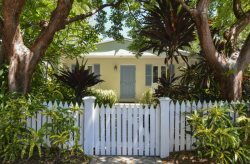 Deckside Suite is one of three units that comprises the group rental property Conch Republic Cottages managed by Key West Hideaways. The maximum people allowed in this property is 2. If there are more than 2 people are in your party upon arrival, your party will be asked to leave without compensation. Parking: This property has a possibility for a reserved parking spot for $10 per day, but there are only 3 parking passes shared with 5 units, so notify us immediately if you need a parking pass. If all 3 parking passes are taken, you are responsible for finding your own parking. The maximum people allowed in this property is 2. If there are more than 2 people are in your party upon arrival, your party will be asked to leave without compensation. Violation of ANY house rules will result in your party being asked to leave without compensation.